Fragrances for men and women are special and what suits one person will not suit the other. The World Wide Web is the marketplace to buy perfumes. Exotic and simple fragrances are available at discounted prices. If you are a newbie to the world of perfumes all you need to do is log on to your favorite search engine and type the word perfume or cologne. And in a second thousand of websites dealing with the world of perfumes will become available. 1. Be a smart shopper and read up on perfumes and articles and tips written by famous people and fashion gurus on how to wear and select a perfume. 2. Browse through sites that specialize in perfumes and check whether hey send out small samplers for a cost. 3. Otherwise make a list perfume brands that appeal to you and go to the nearest shopping district or mall and view the brands first hand. Most malls have perfumery counters that allow customers to take a whiff of fragrances. 4. Think carefully whether your sense of style matches romantic, casual, flowery, or citrusy. 5. Use online tools to find the kind of perfume you like. Compare costs for the brand at different websites. 6. Check whether your favorite perfume is on special offer at auction sites or other websites selling perfumes. 7. Find out whether shipping is free or extra and what kind of packaging they are offering. 8. Find out whether the website will ship from a local site or from offshore. 9. Ask about return policies and guarantees. Find out whether they will give a credit for a returned perfume. 10. Check about the safety of the payment gateways. Before buying a perfume brand find out whether it is eco-friendly and hypoallergenic. Consider if you have any allergies or special requirements. Think about whether you want a bottle, purse vial, or large spray. Always buy a small quantity first so that you have the option of changing the perfume you wear seasonally. There are people who like to try new fragrances and others ho always wear only one brand. So find out which kind you are and order the perfume accordingly. Before choosing a perfume or cologne think about your skin types. Choose a perfume that suits you and matches your pheromones. Always test a perfume by applying a dab on the inside of your wrist and see how long the fragrance remains fresh and inviting. Online stores sell discount perfumes, designer lines, as well as exotic fragrances from all over the world. Most websites also host articles and catalogues describing the different types and give tips for buyers on which perfumes are the best. In case you like exclusivity there are online stores that will mix a perfume just for you. 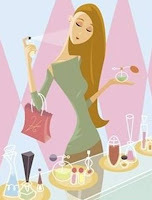 Great site to buy perfumes at a discounted rate is Perfume.net. They have a really big selection of fragrances to choose from, and their prices are so cheap!